Likewise to you guys. Heute ist auch mein Geburtstag. Meinen ganz herzlichen Glueckwunsch – nachtraeglich! Belatedly still counts. I appreciate it. Beautiful detail, Happy 4th Steve! Thanks, Donna. Mountain pinks are beautiful. Some of the plants grow into a cone of dense buds and flowers. Happy 4th July – and birthday! You’re doubly welcome. I see you know some German. Or we could say genug. I’m not sure about that “minus blue” in your title. After all, if you mix red and white, you get pink, and if you mix blue and white with a bit of red, you can create a lovely shade of lavender or lilac: exactly what I see peeking out in that second photo. In short, you’ve created a unique take on the red, white, and blue with a flowery trio that’s perfect for the day. Last week, the cenizo started blooming here. Since last night, rainfall in the area’s ranged from 2″ to 7″. When the rain started, I couldn’t help laughing. Score another one for nature. Happy Independence Day! And, by the way, happy birthday. I have no doubt you’ll put another 365 days to good use, traveling and photographing the sights along the way. Thanks, Linda. We’re barely settling down from the most recent trip, but thoughts of more adventures keep welling up. You’re right that I discounted the bits of purple in the second image, which wasn’t originally in the post but got added late in the process. Those flowers came from a member of the mint family—sage or skullcap, I’m not sure which. The cenizos here were at their peak flowering two days ago. The weather Underground forecast that I checked just now says 50% chance of thunderstorms tonight. If storms emerge they’ll validate the cenizo but will cause unhappiness to a lot of picnickers, boaters, and people out to see fireworks. A couple of hours after I wrote that, we began to hear thunder, and rain soon followed. We didn’t get a lot of rain (so far, at least), but we’re grateful for what we got. We didn’t get more than an inch or so. In contrast, I see Houston had some more flooding. Beautiful! Huzza for the Glorious Fourth! Huzza(h) indeed! That’s what the Revolutionaries would have said. Maybe you can start a campaign to revive the word. Glad to see you are in the pink for July 4th and your birthday. Wishing you and the US the very best. Well said: in the pink. On behalf of the country and myself, we thank you for your best wishes. 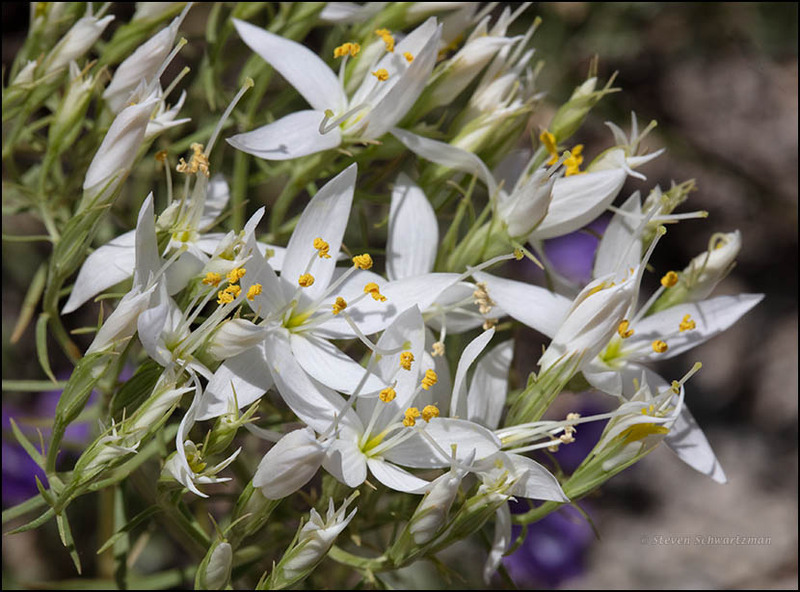 Some know lily-of-the-Nile as firework flower because the blooms look like exploding fireworks, and they happen to be in full bloom on the Fourth of July. They happen to bloom both blue white. Maybe someday I’ll get to see the actual Nile. I’ve never been anywhere in Africa. There are probably more lily-of-the Nile in California than there are in Africa. It is fine with us. I just do not get the impression that lily-of-the-Nile is a desirable perennial within the region that it is native to. Thank you for helping me to ID this pretty little bunch of flowers. I’ve not seen it down here nearer the coast; must be a central Texas squatter. Oh .. and happy birthday! My best friend shares the day as well. You’re welcome. You’re correct that mountain pinks grow in the “mountains,” which is what nineteenth-century settlers called the hills in the Edwards Plateau of central Texas. 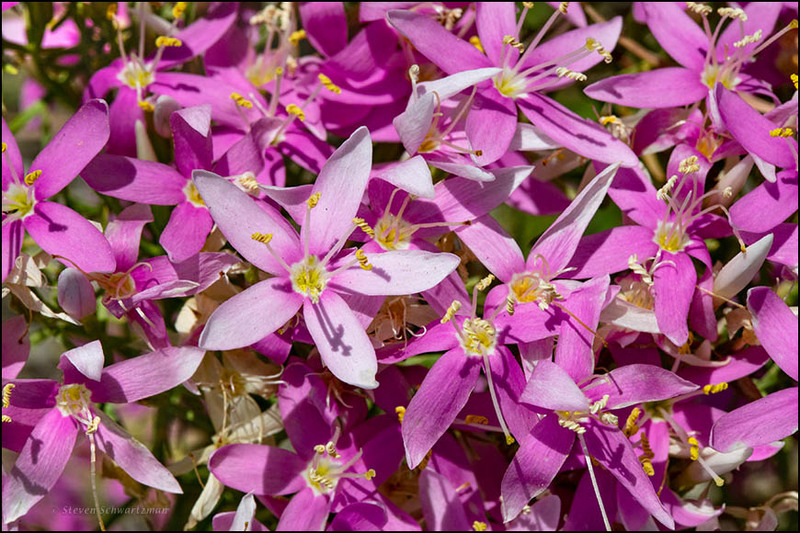 About a decade ago I found some mountain pinks growing along US 290 on the east side of Austin, which is further east than the accustomed range of the species. It was so unusual I took botanist Bill Carr over to see it. He speculated some seeds might have accidentally gotten into a mix that the highway people sowed along the roadsides. I went back each spring for several years to take pictures of the isolated colony, but unfortunately a few years ago that stretch became part of a tollway and construction destroyed the colony. Maybe some year a bunch of the people in an area who share the Fourth of July as a birthday could get together.